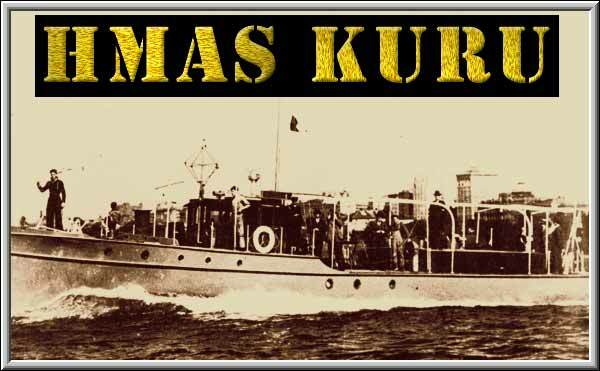 HMAS Kuru - She was hardly a 'Gung-Ho' modern day ship-o-the-line. At just 25 metres long, diesel powered, with a top speed of nine knots she was commissioned into the R.A.N from her prewar employment as a patrol boat out of Darwin searching for Japanese luggers trying to poach pearl shell. Her and her sisters were pressed into service soon after the outbreak of the war. Capable of carrying six tons of cargo and manned by a crew of 21, to convert her into a warship she was armed with a single 20mm Oerlikon Cannon, a number of lighter machine guns and a .50 Calibre Browning machine gun salvaged from the turret of a crashed US bomber. This truly remarkable story begins in mid-April 1942. The Australian 2/2 Independent Company had taken to the jungles and mountains in Japanese occupied Timor and were waging a guerilla war against the enemy but were lacking in badly needed supplies and equipment. "Sparrow Force" as they were known were thought to be all lost or captured until strange radio messages were heard from them back in Australia by way of a homemade radio built from captured and stolen Japanese parts. Now that the Command in Australia realized that they were still alive and fighting, the task of supplying them became a priority. 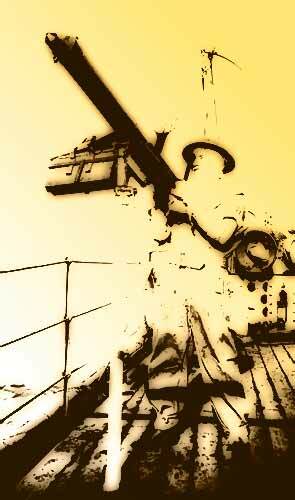 HMAS Voyager. By November it was decided to withdraw the battle weary 2/2nd company from Timor plus 200 hundred Dutch soldiers and eighty or so Portuguese civilians. On 1 December 1942 Kuru was given the task of taking the Dutch and Portuguese off the beach at Betano and ferrying them to Australian corvettes waiting in deeper water. Kuru had completed one trip and was heading back to the beach at Betano to pick up the second group of evacuees when out of the black stormy sky, nine Mitsubishi bombers attacked the Australian ships. Armidale was sunk almost immediately and just after noon the Japanese turned their full attention to the little Kuru, the vessel which had become a thorn in their side by her previous successful supply drops. They were determined to get her. A force of forty six bombers and seven 'Zeke" fighters, possibly the fiercest attack ever launched against an Australian warship, or any ship of any navy for that matter, were sent to sink her. The opening assault was launched by nine bombers which made bombing runs in waves of three. Kuru weaved frantically across the water as bombs exploded all around her. It was her constant manoeuvring and small size that made her such an elusive target. Next, the Japs tried attacking in 'box formation' their bombs straddling her. So, it went on, wave after wave, then fighters, then seaplanes, whilst Kuru's Gunners with their light armament spat defiance. Raked repeatedly by exploding shells and bomb shrapnel the little vessel took it all and still managed to steam defiantly onwards. The Japs continued their nonstop bombing and strafing runs for seven long, terrifying hours. During that time more than fifty aircraft, mostly heavy bombers tried unsuccessfully to sink Kuru. As the hours wore on the Japanese intensified their attack, determined Kuru would not escape but with the aid of time the sun began to set, forcing the Japs to call it a day and for HMAS Kuru to return triumphantly to a heroes welcome in Darwin. Kuru had performed a miracle by surviving a massive air attack directed at her by all the might the Japanese could muster.